Don Juan de Aquila is also the ‘Spaniard’ who inspired the famous Kinsale pub. THERE ARE PLAQUES all over Cork City that reflect the weird and wonderful heritage of the Rebel County. 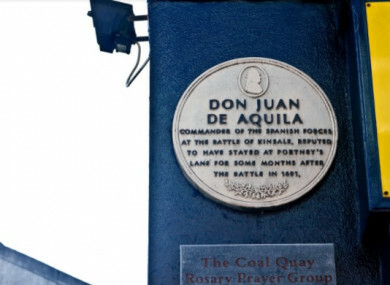 On Cornmarket Street, there’s a highly unusual one, though – it’s a bronze plaque, dedicated to one Don Juan De Aquila, a Spanish general who stayed in this spot in 1601. When Don Juan, the chief general to the King of Spain, shacked up on Cornmarket Street, Ireland was in chaos. Munster – ruled by the English, claimed by the rebel Irish – was a major battleground for the Nine Years War. After a number of decisive victories in Ulster, it was thought that the Irish were on the cusp of winning. With this in mind, the King of Spain jumped into the fray. The Spanish had always been happy to wage war against the English: they’d been funding Irish rebels for years. However, in 1601, King Philip II decided to send a fleet of men, led by Don Juan De Aquila, to Ireland. Their landing port? Kinsale, Co Cork. To cut a long story short, things didn’t go so well for Don Juan and his 6,000 men: wintry conditions and a reinforced English army saw the Spanish-Irish forces defeated after a two month long standoff. It didn’t end well for Don Juan, either: He was placed under house arrest upon returning to Spain, with a war council prepared against him. He never stood trial, however: according to historians he was “overwhelmed by this arrest” and died the following August. A monument to him stands on Cornmarket Street in Cork City, commemorating the spot where he stayed after his defeat. Elsewhere in Cork, you’ll find The Spaniard pub, named in honour of Don Juan. Not bad for a failed general, really. More: What’s with the burning building logo all over Dublin city centre? Email “Double Take: The tribute to a failed Spanish general on Cork's Cornmarket St”. Feedback on “Double Take: The tribute to a failed Spanish general on Cork's Cornmarket St”.